Born in Canada, Coughlin was ordained a Catholic priest in Detroit and began in 1930 experimenting with radiobroadcast sermons and religious lessons for children. His popularity exploded, and he became the first electronic-media evangelist; however, his shows became increasingly political. At first he attacked President Herbert Hoover and supported Franklin D. Roosevelt, but then turned on Roosevelt with diatribes protesting the New Deal, warning against Communism, and railing against the influence of Jews in government and business. 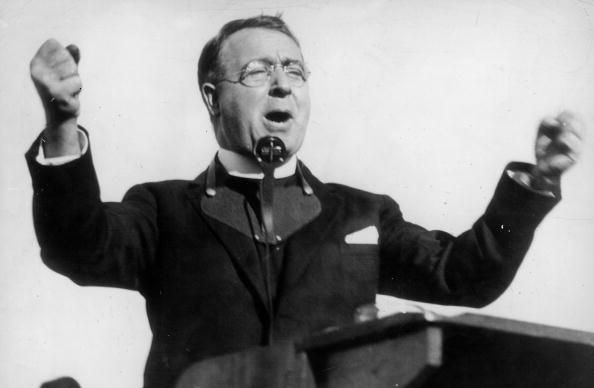 His magazine, Social Justice, was banned for violating the Espionage Act and closed down in 1942, the same year that Church authorities ordered him to stop broadcasting.